Sorry, I wasn’t able to weave any towels in October simply because the end of September and all of October were extremely busy for me, but all in a good way. I give you here, all of the exciting learning events and happenings for me over the month. 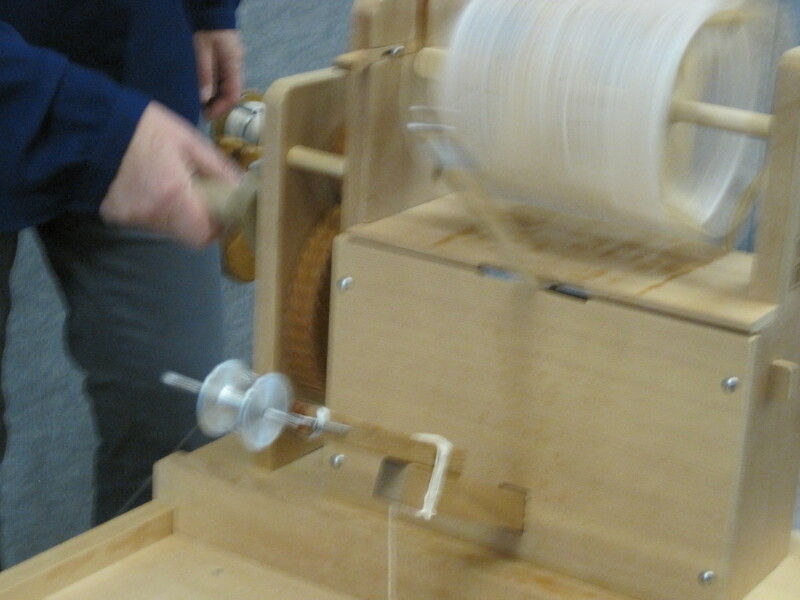 1) September 24,25,26 – An intensive three day Silk Spinning Workshop with Kim McKenna. Kim is an extremely knowledgeable and generous teacher, and her workshops are very full of information about spinning/dyeing in general in addition to the subject being focused on. In this workshop we learned about every kind of silk available, where it comes from, how to spin it, how it is processed and what to do with it. Kim provided us with over 40 generous samples of silk, from the expected bombyx and tussah to Eri and Muga, in all forms including reeled silk, slivers, roving, hankies, noils, laps, carrier rods, throwster’s waste, peduncles. 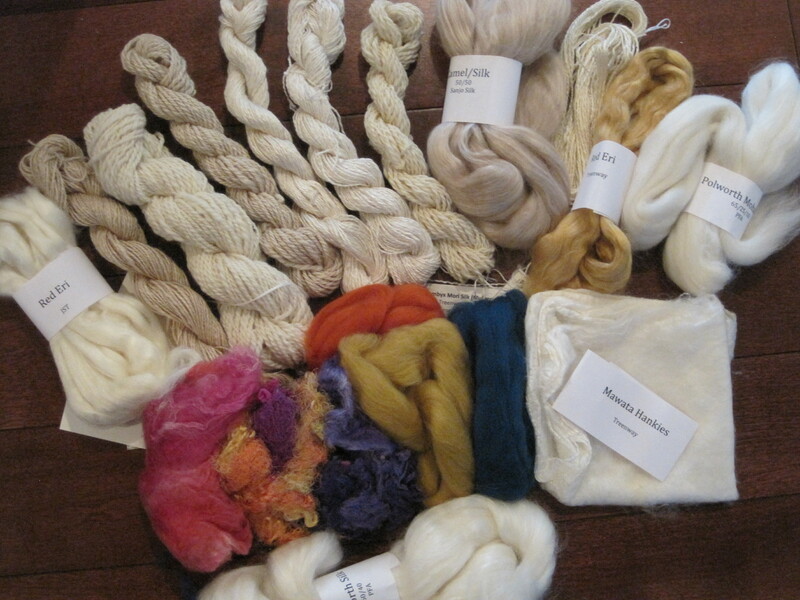 The silk blends included silk with linen, bamboo, wool, seaweed, camel, alpaca and llama. Kim also taught us how to make our own blends, how to document our results, and different ways of plying our singles. So, I came home with a very big bag of samples and fibres to play with. This picture shows only about a third of all the samples. Some I finished spinning, some I still want to blend, and some I still have to spin. 2) October 2 – Dyepot club – we participated in bucket dyeing. See the socks below, which are a result of this play. Thanks, Terry. 2) October 3 and 4 was the Knit City fibre event with vendors, demonstrations, workshops and lots of fibre interaction. 3) October 8 – Block Study Group meeting where we continue to explore blocks, drafts and other weaving adventures, loosely following the Ontario Handweavers and Spinners home study modules. 4) October 12 – Canadian Thanksgiving and family gathering. Good food and good times. 5) October 16, 17, 18 – Peace Arch Weavers annual Fibre Flare Show and Sales, with set-up Friday night, Saturday and Sunday sales, customer support, demonstrations, silent auction. The event was successful and tiring, but so worth it. Such fun to see what everyone has been working so hard on all year. 6) October 29, 30, 31 – I attended a three day workshop on Bhutanese Weaving taught by Wendy Garrity at the Maiwa Symposium on Granville Island. Another great learning adventure and meeting friends old and new. We have such a great weaving community! These are the samples I managed over the three days of the workshop. The inlay technique is not fast at all, but very satisfying. 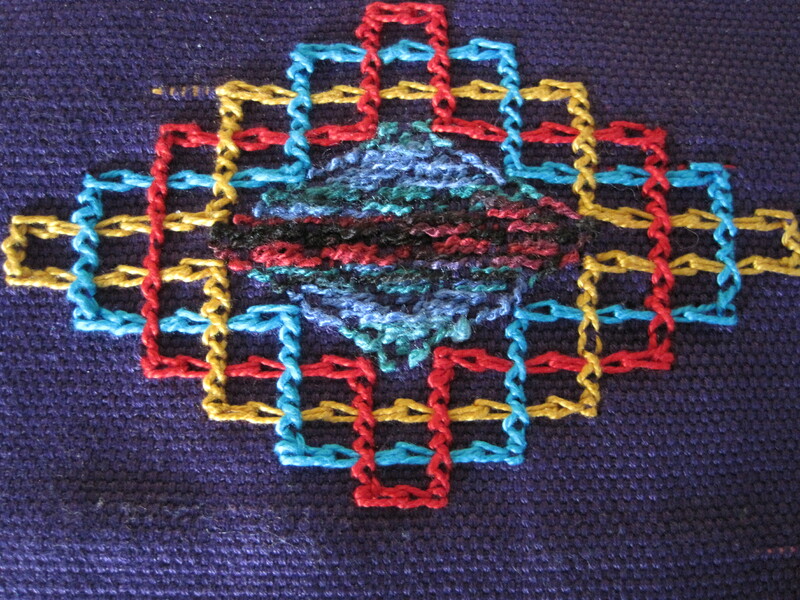 In between the spaces of time I accomplished some weaving. This scarf turned out just the way I wanted in turned twill blocks. The warp is my handspun from fibre purchased from Ellen Hamilton (70% mohair/30% merino), sett at 20 ends per inch, and the weft is 20/2 silk from Jane Stafford Textiles. I love the juxtaposition of the shiny, smooth silk against the hairy, mat mohair. The drape is excellent. 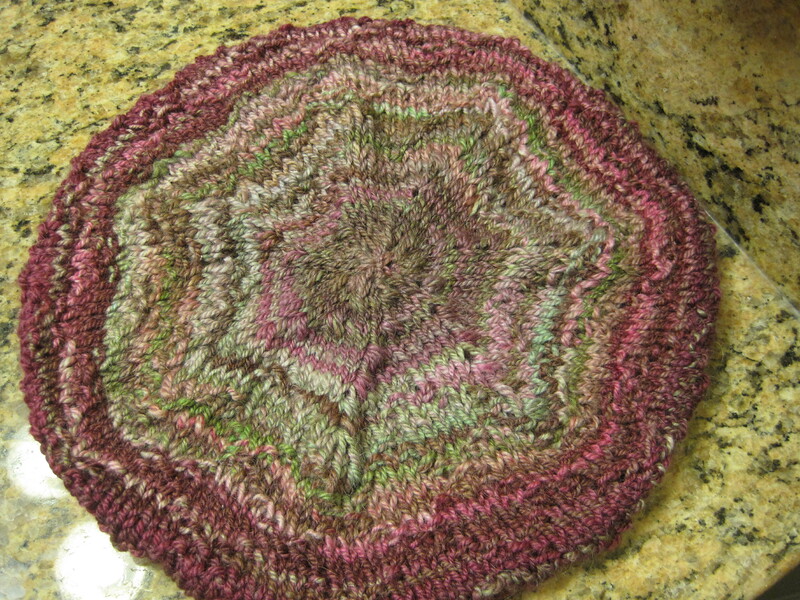 I used the bright pink/purple/mohair handspun as warp and the “Budha Berry” silk as weft. 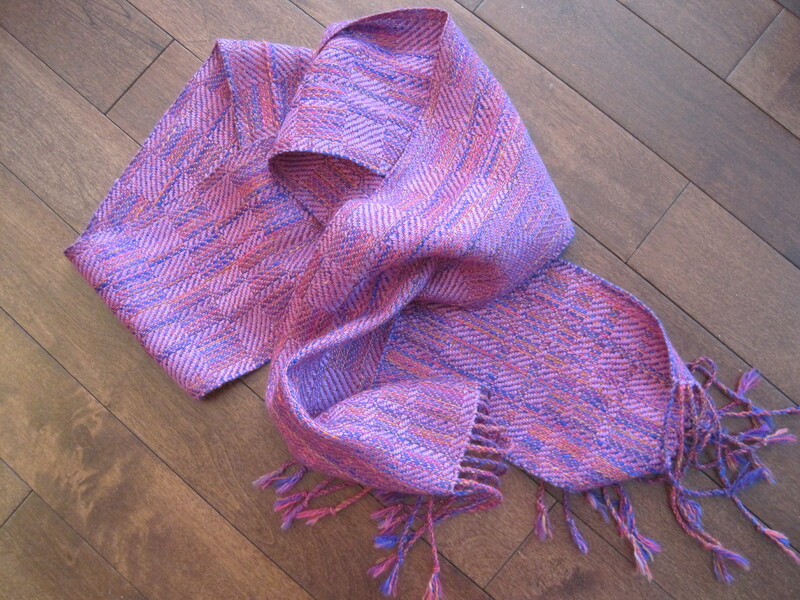 The colours are brighter than the picture of the scarf would suggest, more like the colours in the skein picture – a bright, almost fuchsia tone. 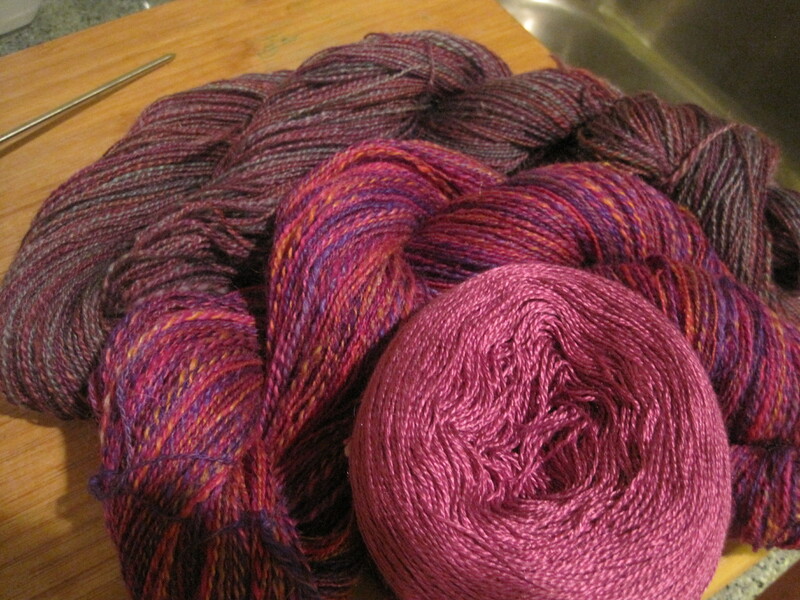 I also did a good amount of spinning, dyeing and knitting. 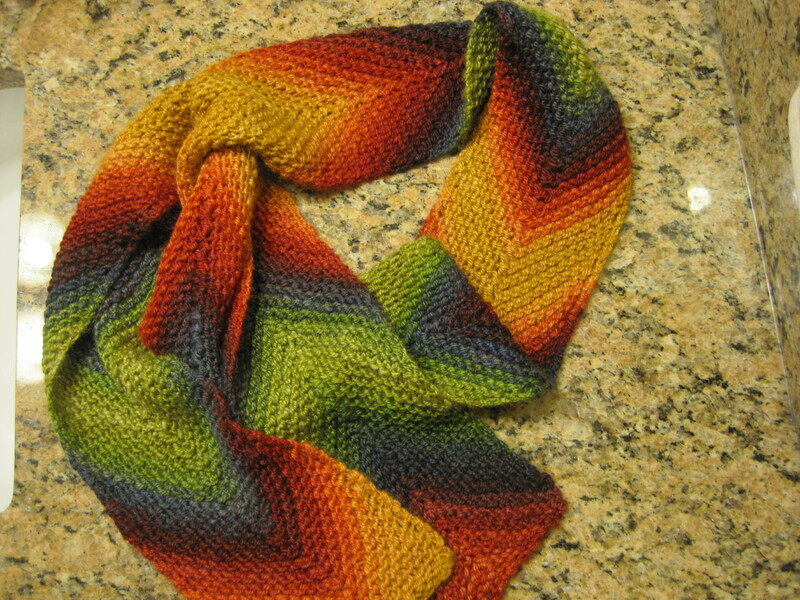 I finished knitting the chevron scarf from yarn I spun from a lovely autumn blend of colours from indie dyer Woolgatherings. 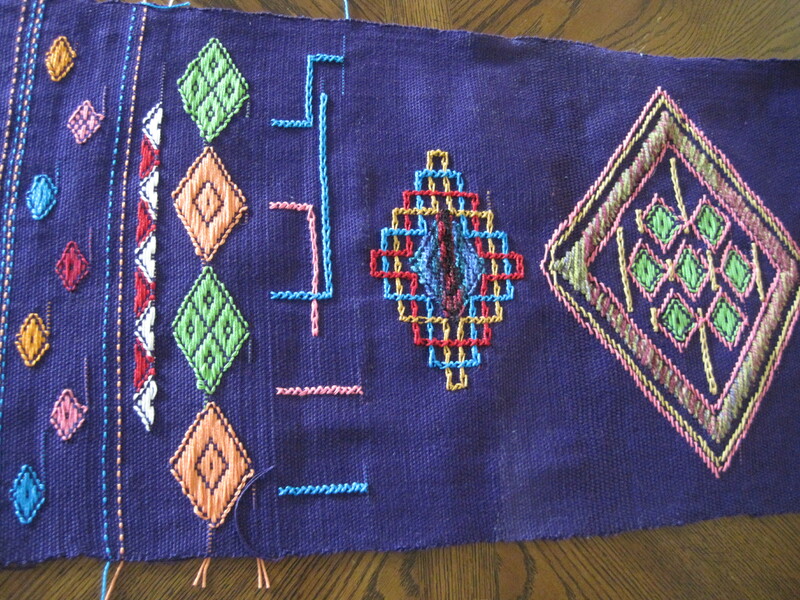 The singles were chain-plyed (sometimes called Navaho plying) to keep the colour blocks intact. 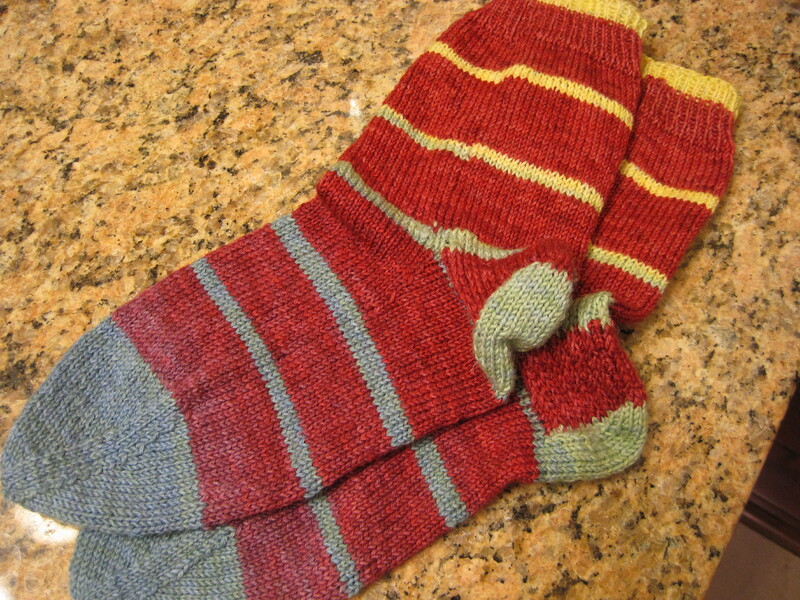 I knit some yummy socks from two balls of wool that were simultaneously dyed through colour gradients in a bucket. Starting with yellow, additional colours were added as the ends of the two balls of yarn were progressively pulled out of the bucket. The colours moved from yellow, through green and blue then into purples and finishing with red. I knit the socks, starting with the yellow from one end, and then the red from the other end of the ball, alternating ends of the ball, and ending somewhere in the middle. If you haven’t tried bucket dyeing, you should put it on your dyeing bucket list! And finally, a funky slouch tam knit from a three-ply yarn I spun – fibre from West Coast Colour and Carding P.M.S. – Polworth wool, Mohair, and Silk. 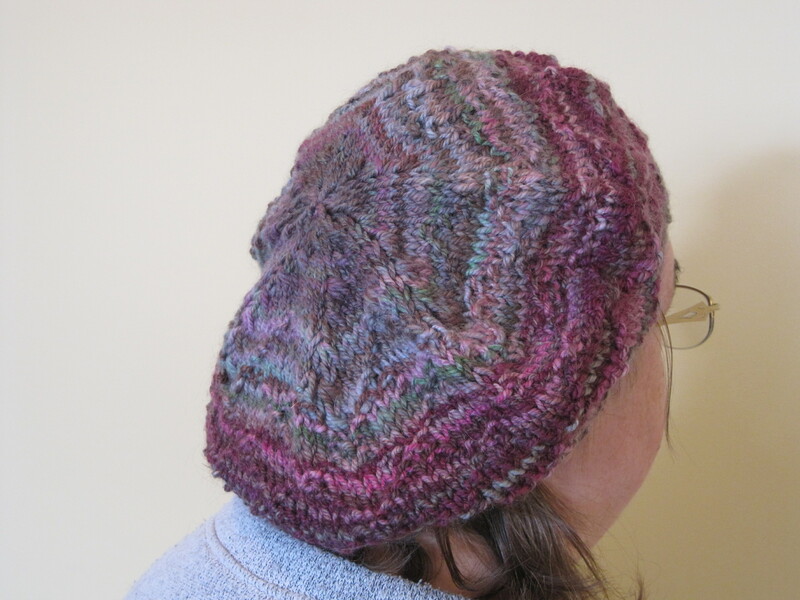 The pattern is Classic Elite Yarns Diamond Cap from Ravelry. 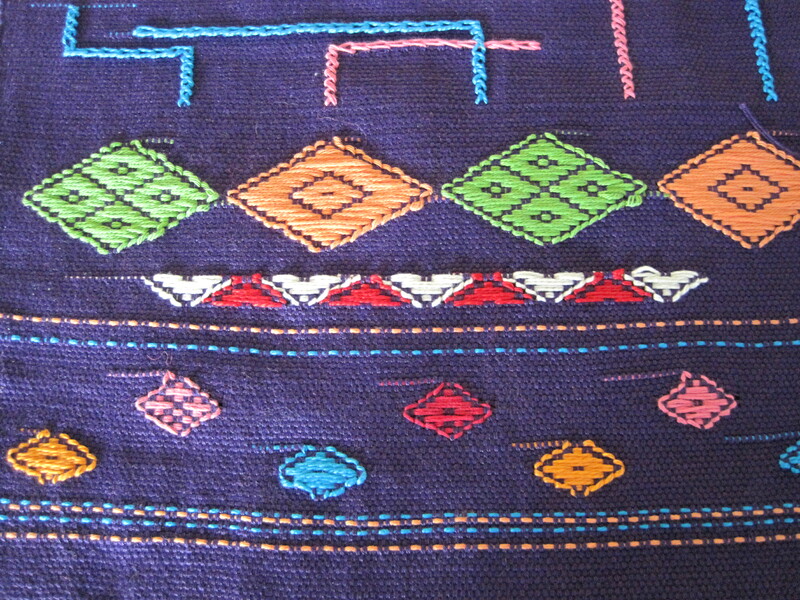 The diamond pattern is a little obscured by the colour changes, but the texture is there. So, if I missed you this month, this is where I’ve been! This entry was posted in Uncategorized and tagged colour, Guild, handspun, knitting, Roving, Scarf, Silk, Spinning, Warp, Weaving, Weft, Wool, woven, yarn. Bookmark the permalink. Barbara, you may not have woven, but you have definitely been creative. The workshops looked fantastic. How great to have access to these. The scarf must looks beautiful and must feel luscious . Good grief! What a month! You are doing so much and learning so much! FAB!